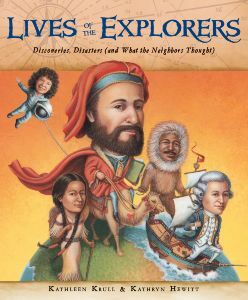 With Columbus Day right around the corner – at least around the flip of the calendar page – now seems a good time to talk about explorers. And Kathleen Krull does a pretty good job. “Exploring the unknown: it’s what humans do. Since the beginning of time, we have wanted to know what else might be out there.” And then she delves into the stories of people searching for “what else might be out there”: Leif Ericson, Marco Polo, Zheng He, James Cook, Lewis & Clark, Isabella Bird, Sally Ride, and more. From the well-known to the not-as-well-known, Krull tells about explorers’ lives, where they traveled, their deed both good and bad. Marco Polo, for example, tended to exaggerate his journeys and Columbus…. his encounters with the New World natives nearly wiped out their populations. There are plenty of maps for the geographically-minded, with routes color-coded for different voyages. And each chapter ends with an “Onward” section full of interesting facts, towns named after the explorers, myths and more. At the back there’s a list of books for further reading. There is no index, but the table of contents fills that need fairly well since this is, after all, a collection of short biographies. This is a great choice, Sue. I have read the book and really enjoyed it. It’s a great jumping off point for kids. They will surely find some interesting people and will want to do more research on their own. HI Sue, I like to hear that this book includes the famous and not-so-famous explorers. It looks like an interesting selection of books.